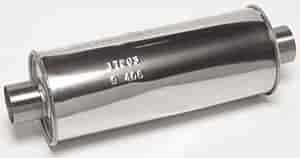 Dynomax Ultra Flow SS Welded Muffler In/Out: 2-1/2"
Does Dynomax 17263 fit your vehicle? 17263 is rated 5.0 out of 5 by 1. Rated 5 out of 5 by Gabe from Installed on a 2012 wrangler Had a shop install this on my 2012 Jeep Wrangler and it sounds perfect, deep sounds and not too loud.